EasternEarthMother – This is a resource for natural baby and child care. Things and ideas I have found useful, including groups locally to me in Lowestoft on the East coast of England, and national and worldwide sites. Hopefully this will be a platform where others can also share experiences and ideas. This is a resource for natural baby and child care. Things and ideas I have found useful, including groups locally to me in Lowestoft on the East coast of England, and national and worldwide sites. Hopefully this will be a platform where others can also share experiences and ideas. Can you fly through the stormy clouds and break through, to feel the sun on your face? When your ship is off course, can you fight through the pirates and take the helm again? Can you dive down through the murky seas to open the shells and find the pearls of wisdom within? Can you feel the fear, but also the fierce lioness that roars in your heart? Can you cast off the rabbits cloak that no longer serves you, and embody your greatness? Can you take deer’s medicine and defeat the demon that stands in your way, by surrounding them in gentle love? Can you become the warrior princess you were born to be? Can you step forward in your own greatness? Can you break out of your cocoon, and unfurl your wings in the light? We have been practising baby led pottying/Elimination Communication/EC part time, since Rowan was about 3 months old. He does wear nappies, but I used to hold him on the potty when I did a nappy change, or thought he wanted a poo. We found he got on best with a vintage child chamber pot, with a potty cosy round the top, so it was comfortable. We have gone through phases of more catches, or more misses. He was doing quite well up until age one, but then went through a stage of more misses, and not wanting to sit on there, as he got more mobile. However we have had a turning point recently, from about 15 months when he started to enjoy books more, and it became potty reading time. He has also started to to do the sign for potty the last few days, at 16 months. Although, sometimes after a poo! We have been doing the born ready chest slap, which seems to work well! Overall I think in some ways it has been more work, but I think Rowan will potty train earlier than some other toddlers, so hopefully less nappies! It has also meant less poo scraping of nappies! I think it has helped him keep awareness of when he wants a wee/poo, and I think he prefers it to nappies. I know not many people do this in England, but I would say give it a go! Click here for recommended reading. I am writing this because I don’t think enough emphasis is placed on the effects of diet in general and especially when pregnant and breastfeeding. I didn’t realise how important it was until I came across the work of Weston A Price when my boy was about 8 months old. Weston A Price was a dentist in the 1930’s in America, he noticed a decline in peoples dental health and wondered why this was. He decided to travel around the world and study the teeth and health of different populations. He realised that the teeth and skull formation of babies reflected the overall skeletal and organ formation and health. The diet and health of the pregnant mother had a large impact on the bone structure of babies. He found certain populations around the world that had brilliant bone structure, very good health, and lived on a traditional diet, without modern convenience foods. Although these diets were different they had certain aspects in common, which he recorded. He also found that when related groups had been exposed to modern processed foods they developed teeth decay, and their children had narrow faces, buck teeth and overcrowded teeth. This was also related to health problems. Sugar, white flour and processed vegetable oils, were particularly blamed. I found this information rang true with me because this is a problem I have had. I had to have teeth removed when I was younger because of an overcrowded mouth, and have a brace for buck teeth. I also had a very poor diet when I was younger of microwave meals, sugar, processed foods, MacDonalds, margarine an semi-skimmed milk. I believe these are also the foods my mum was eating when she was pregnant. I am not trying to blame anyone here, she didn’t have much time because she worked, and believed the TV adverts. But I have realised what if we could get this information out there and change people’s eating habits, and stop the cycle continuing? There seems to be a growing awareness of nutrition and I feel it is my mission to be part of that at the moment. More modern research has shown some of the shocking effects of lack of certain vitamins during pregnancy. The effect of lack folic acid (a B vitamin) causing spina bifoda is well known, but what about lack of vitamin A causing blindness in children? Why Raw Milk is Great! 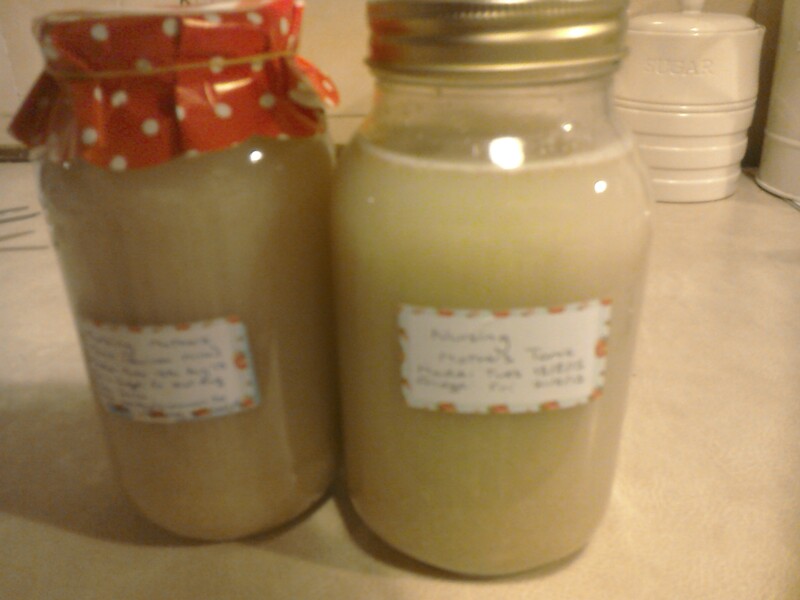 I have only recently found out the benefits of raw milk, but we are now getting through about 5 litres a week. Before this most recently we were drinking Koko coconut milk, but I am now a bit unsure of the additives in this. It is also meant be be very good while breastfeeding and for children, although the NHS advise against it while pregnant, so do your own research and decide. We are lucky enough to be in driving distance of a fantastic dairy http://www.the-calf-at-foot-dairy.co.uk, which is just a few miles from Lowestoft. The cows are 100% pasture fed, and the calves get to keep with their mum until they are weaned, which is a much more compassionate way of doing things. (Not all raw milk producers do this.) It is run by a lovely family who really care for the animals, and for great quality milk. They also sell beef and do mail order. What is so good about raw milk? Basically it contains more enzymes, vitamins and probiotics and is easier to digest. Grass fed Jersey and Guensey cows, goats, buffalo and humans produce A2 proteins, which are easier to digest than the A1 proteins from black and white Freisian and Holstein cows, although this is still disputed science. It also tastes fantastic and has higher welfare standards. The Weston A. Price foundation (W.A.P.F.) has done a survey showing some people with lactose intolerance can tolerate raw milk, this has certainly been the case with my husband who feels sick after drinking pasteurised milk, but can drink raw milk. It does cost more than pasteurised supermarket milk, but we have managed to save money in other ways by cutting back on processed foods. In my opinion it is a far superior product than supermarket milk, and it is worth it, to know the cows have the highest welfare standards. At The Calf at Foot Dairy the cows don’t get their calves taken away at birth to be shot or made into veal. I have realised that good producers have to be supported if they are to exist. ‘It is very difficult to determine the risk of drinking raw milk on a per-serving basis compared to pasteurized milk and to other foods. For starters, the risk of illness from all dairy foods, raw and pasteurized, is very low compared to other foods—amounting to only 1 percent of all illnesses. A government document published in 2003 indicates that on a per-serving basis, deli meats are ten times more likely to cause food-borne illness than raw milk (Listeria Monocytogenes Risk Assessment: Interpretive Summary, Center for Food Safety and Applied Nutrition, Sept. 2003, page 17). I encourage you to all join the raw milk revolution! This is a successful recipe! It is from Nourishing Traditions by Sally Fallon. I used Yeo Valley Natural Yoghurt, and produced cream cheese, (which tastes a bit like Philadelphia, but better) and whey which is useful in loads of recipes. You need to set up a bowl with a sieve on top, (I used a plastic one have read this is better when making kefir), and line it with muslin or cheesecloth. Then just take some yoghurt, (about 250g is a good amount, you can use more), put it on top of the fabric, and put a plate on top. Wait several hours, until the whey and yoghurt cheese separate, then tie up the cloth and hang over the bowl using a wooden spoon until the whey stops dripping. 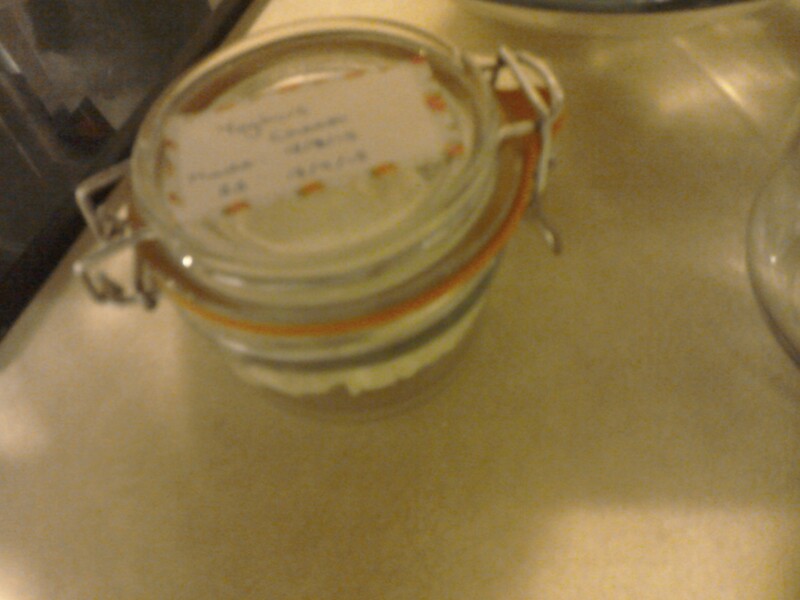 Then put in jars in the fridge. The yoghurt cheese should last about a month, and the whey about 6 months. Brilliant! This can also be made with raw milk, pimma milk or buttermilk, see http://thenourishingcook.com/1-whey-cool/#more-37. I tried it with raw milk, I thought it was ok, but my husband said it tasted like gone off milk and wouldn’t eat it! Give it a go, I really recommend this recipe! I kept one jar and gave one to a friend who had recently had a baby. My boy was 11 and a half months, and still nursing. Like a lot of the drinks I have tried from the book I would say it is an acquired taste, but improved by the recommended honey and cinnamon! 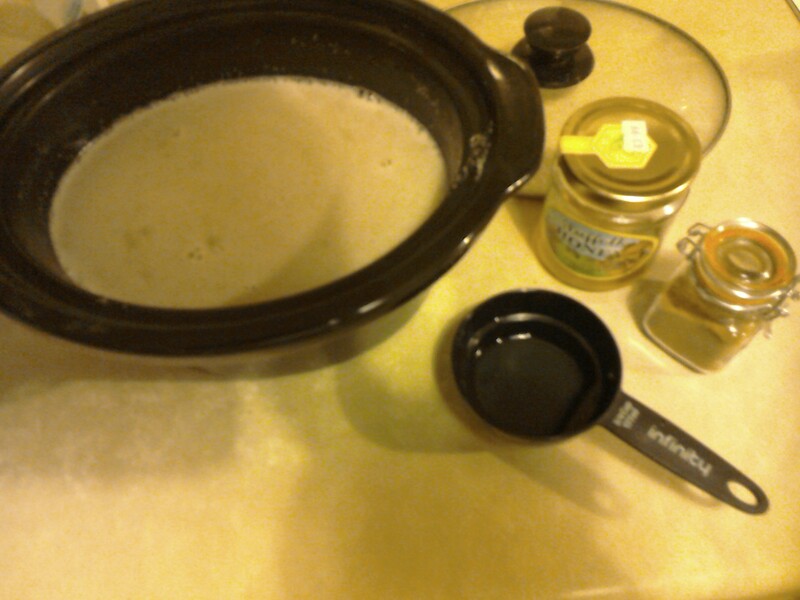 I ended up adding some to my evening warm drink, which is my own concotion of 3/4 tsp Barley Cup, 1/3 tsp raw cacao powder, 1 tsp coconut oil, 1/4 tsp molasses, 1/8 tsp cinnamon, (optional 1/8 tsp ground ginger) boiled and slightly cooled water and raw milk. Works for me! I try to make sure the water isn’t hot to deactivate the enzymes. However not sure the Barley Cup and raw cacao are strictly allowed with the Weston A Price recommended diet. Soak quinoa for 12 hours in warm water, rinse and drain. Cook quinoa in the water covered for several hours until mushy ( I cooked it in a slow cooker), put through a food mill (I used a hand held blender). Place in a 2 quart jug with rice and whey (for whey recipe see http://thenourishingcook.com/1-whey-cool/) (I used 2 x 1 litre kilner jars). Leave at room temperature for 2 or 3 days, transfer to fridge. (A certain amount of separatioin is normal). Serve with honey and cinnamon and enough water to reach desired consistency.